Charity Walks are a wonderful way to improve your own health and raise money for worthwhile Washington, D.C. area charities at the same time. Special events are held each year, providing the perfect opportunity to volunteer some time, set exercise goals, and make new friends. Here is the schedule of 2018 walks in the Washington, D.C. area, including Maryland and Virginia. Note, the exact dates are updated as announced. 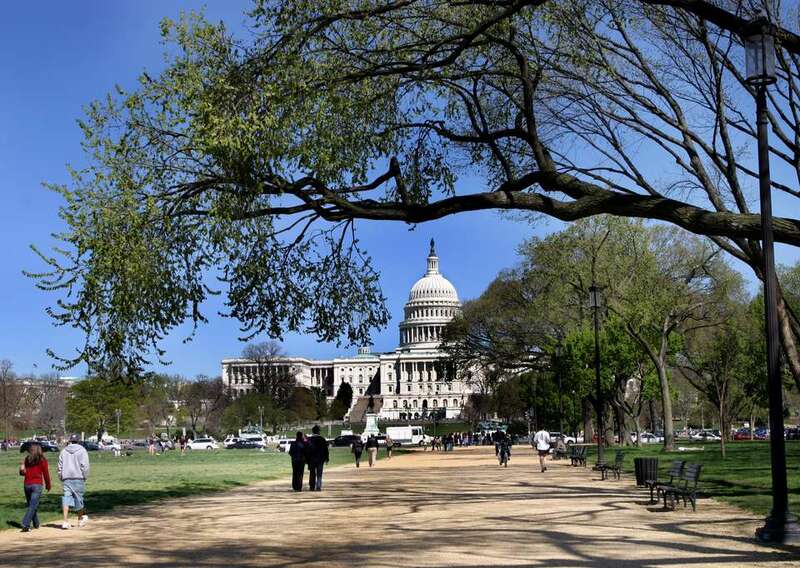 The Scope It Out 5K will kick off at Freedom Plaza, 13th & Pennsylvania, and will include a scenic tour of popular DC sites including the National Gallery, Newseum, FBI Headquarters, Ford’s Theater, U.S. Botanical Gardens, and the Capitol. The event, held during National Colorectal Cancer Awareness Month, is focused on cancer awareness and calls attention to the colonoscopy. The Washington, D.C. Metro Area has the third highest colon cancer mortality rate in the country. Overall, colon cancer is the 2nd leading cause of cancer deaths for men and women combined. April 14, 2018 - Washington, D.C. The 2-mile walk along the National Mall raises money for the Epilepsy Foundation to ensure that people with seizures are able to participate in all life experiences; and to prevent, control and cure epilepsy through research, education, advocacy, and services. Make-A-Wish Mid-Atlantic raises money to grant the wishes of local children with life-threatening medical conditions. Participants of all ages enjoy a walk, local food, music, family activities, and special guest appearances. Presented by StoneSpring Emergency Center, the proceeds from the race benefit local breast cancer patients. By partnering with Inova Loudoun Hospital as well as several local vendors, the Step Sisters provide transportation, fresh food delivery, house cleaning, lawn services, and childcare for those undergoing treatment for the disease. In memory of Dr. Clement B. Knight, the walk raises money for the LUNGevity Foundation to fund lung cancer research. Dr. Knight, who died August 9, 2012, at the age of 62, was recognized in the Guide to Top Physicians for many years. Lung cancer is the top cancer killer in the United States, claiming approximately 160,000 lives per year. It is a devastating disease that can afflict anyone, regardless of smoking history, gender, or ethnicity. The 5K event helps local families transition out of homelessness while preparing their children to enter kindergarten ready to read and ready to learn. The annual race is organized by volunteers from the Junior League of Washington. Participants will receive a t-shirt, running bag, food, and water, and will be entered into a drawing for raffle prizes. Meet at the new location for 2018 on Pennsylvania Ave. NW. This walk, sponsored by Booz Allen Hamilton, is a fun, family-oriented event. Walkers raise awareness and money to benefit the fight against Multiple Sclerosis. MS, an unpredictable, often disabling disease of the central nervous system, interrupts the flow of information within the brain, and between the brain and body. MS affects more than 2.3 million worldwide. May - Greenbelt, MD, Annapolis, MD, and Nationals Park, Washington, D.C. The Arthritis Foundation's signature event raises funds and awareness to fight arthritis, the nation's most common cause of disability. Participants walk in honor of a friend or family member in a three-mile or one-mile course and take part in activities for the entire family. The Avon Walk is a marathon walk spread-out over a Saturday and Sunday. You can walk as far as you choose or up to 39 miles throughout the weekend. In order to participate as a walker in the Avon Walk for Breast Cancer, each person commits to raising a minimum of $1,800 towards the fight against breast cancer. Relay for Life is an American Cancer Society fundraiser, an overnight activity where teams of people gather at schools, fairgrounds, or parks and take turns walking or running laps. This charitable event brings a community together to raise money to prevent, detect, and treat cancer. The 5K in National Harbor kicks off Public Service Week and gives government employees, their families and friends a way to show their support and appreciation for our nation’s dedicated public servants. Proceeds will benefit the Federal Employee Education and Assistance Fund (FEEA), a non-profit organization that provides scholarships and emergency assistance. Advance registration is required. This is a 5K walk/run with the goal of raising $1.5 million to fund innovative brain tumor research and support for families affected by this devastating disease. Proceeds benefit two not-for-profit organizations, the Brain Tumor Society and Accelerate Brain Cancer Cure. The race includes a Kids' Fun Run, the Wall of Hope, and tributes to brain tumor survivors. The annual event raises awareness and funding for Concerns of Police Survivors (COPS), a not-for-profit organization that honors law enforcement officers who have given their lives while serving in the line of duty. The 5K will begin on 3rd and E Street, NW and will finish on 4th Street, NW, near the National Law Enforcement Memorial. Ronald McDonald House Charities® of Greater Washington, D.C. helps children heal faster and better. The family-friendly Red Shoe 5K is for racers, leisure walkers and runners. Kids can get community service hours. The race starts at 9:00 a.m. Kids Fun Run at 8:45 a.m. Competitive and non-competitive runners and walkers are welcome. People within a local community form teams through their workplace, clubs, and organizations or with friends and family. The walk is a fun, family-oriented celebration that includes kids activities, food, and festivities. The event is held in Anacostia Park on Armed Forces Day and will benefit the Semper Fi Fund, a non-profit organization that provides financial relief to service members and their families for needs that arise during hospitalization and recovery, as well as perpetuating needs such as home modifications, customized transportation, and specialized equipment. Advanced registration is required. May - Leesburg, VA / June - Washington, D.C. The 5K walk and 2K family fun walk is sponsored by the Capitol Chapter of the Juvenile Diabetes Research Foundation with the goal of creating a world without type 1 diabetes. Each year, more than 900,000 people raise over $75 million for life-changing research. Music is provided and families can enjoy live entertainment, children's activities, and snacks donated by vendors. The 5K event raises funds for breast health and breast cancer education, screening and treatment programs for the medically underserved. The race gathers together more than 40,000 participants from across the country, including more than 3,000 breast cancer survivors. Meet at Freedom Plaza, 14th St, and Pennsylvania Ave NW. The family-friendly 5K walk will be held in over 65 communities across the country. St. Jude Children’s Research Hospital is internationally recognized for its pioneering work in finding cures and saving children with cancer and other catastrophic diseases. St. Jude is the only pediatric cancer research center where families never pay for treatment not covered by insurance. No child is ever denied treatment because of the family’s inability to pay. The Columbia Lighthouse for the Blind sponsors the walk to raise money for programs that help the blind or visually impaired population of the DC area overcome the challenges of vision loss. The event will also include a kids race for ages 3-8 and a silent auction. The family-friendly 1.5-mile self-paced walk at Nationals Park benefits the Parkinson Foundation of the National Capital (PFNCA), a non-profit organization that improves the quality of life of those impacted by Parkinson's disease, their care partners and families, and fosters a sense of community to ensure that no one battles the disease alone. PFNCA provides exercise, communication and education programs to strengthen the physical and emotional health of people impacted by Parkinson's in Washington, D.C., Maryland, and Virginia. The event will include photo opportunities in the Nationals Dugout, exercise, yoga and dance demonstrations, children’s activities, and more. The CureSearch Walk celebrates and honors children whose lives have been affected by childhood cancer while raising funds for lifesaving research. The Spinal Research Foundation hosts the event in honor of National Osteoporosis Awareness Month with proceeds supporting programs of research and education to improve spinal health care for all Americans. A Spinal Health Fair will include family-friendly activities such as interactive play areas, color & learn stations and a moon bounce. October - Reston, VA and Washington, D.C. This non-competitive event focuses on increasing awareness about kidney disease, those at risk and the need for organ donation. The event is free and open to the public, although individual participants and teams are encouraged to raise money for National Kidney Foundation Serving the National Capital Area, which is especially important considering the Washington, D.C. metropolitan area has the highest prevalence of kidney disease in the United States. The Northern Virginia Buddy Walk is a short walk followed by a large festival with fun for all ages. More than 2000 participants are expected to raise funds in support of the awareness, education and advocacy efforts of the Down Syndrome Association of Northern Virginia. Walk festivities include moon bounces, a rock wall, train rides, agility dogs, police, fire, and rescue equipment including a police helicopter, cartoon characters; Dora the Explorer, Goofy, & Scooby Doo, face painters, magicians, food vendors, an exhibitor pavilion plus much more! October - Reston, VA (rain or shine), Rockville, MD, and Washington, D.C. The annual walk and fundraising event pays tribute and brings hope to those battling cancer. Walkers gather at twilight holding illuminated balloons to support and honor survivors and loved ones lost. The event includes live music, free food, and fun activities for the entire family. The walk is the nation’s largest event to raise awareness and funds for Alzheimer care, support, and research. Participants will learn more about the disease, advocacy opportunities, clinical trial enrollment, and the Association's support programs and services, and will join in a meaningful tribute ceremony to honor those affected by Alzheimer's. Participation is free. Walkers are encouraged to raised funds. The 5K Walk/Run to raise awareness and funds to support individuals with intellectual and developmental disabilities will take place on closed roads along The National Mall around Washington, D.C.’s best-known monuments and memorials. The annual (3.1 miles) race/walk will raise money for the nationally and internationally renowned Children’s National Medical Center in Washington, D.C. which serves more than 360,000 children and provides more than $50 million in uncompensated care every year. The event will raise critical funds for the hospital’s ongoing effort to provide specialized pediatric care, conduct research into childhood disease prevention and treatment, and provide wellness and preventative services to keep children healthy. This family-friendly 5K walk supports the Hearing Loss Association of America to raise awareness and help to eradicate the stigma associated with hearing loss. Money raised is shared between the national organization and local walk sites to provide information, education, advocacy, and support. The event includes music, free food, and fun activities for the entire family. Registration begins at 10 a.m. and the walk begins at 11 a.m. The 5K Walk supports the American Foundation for Suicide Prevention. Proceeds will benefit local and national suicide prevention and awareness programs. The walk will be held from 5:30 - 7:30 p.m.
AIDS Walk Washington is a 5K fundraising walk benefiting Whitman-Walker Clinic, a Washington, D.C. non-profit community-based health organization committed to ending the suffering of all those infected and affected by HIV/AIDS. The American Cancer Society’s Making Strides campaign is the only campaign with the American Cancer Society that's dedicated to breast cancer. All the money raised from the walk will benefit breast cancer research, advocacy, prevention, and patient services within the Greater Washington metro area. Registration begins at 9 a.m. on the grounds of the Washington Monument. The walk is the American Heart Association’s mission in action. This annual celebration promotes physical activity and heart-healthy living in a fun, family environment. As the signature fundraising event, the Greater Washington Heart Walk is expected to raise $2.5 million for the American Heart Association’s life-saving mission. There is a 3-mile walk with a one-mile short course. Health and wellness expo for the entire family. Friendship Walks is a 1.5 mile, fun and peaceful rally around the National Mall focused on ending homelessness in the Washington, D.C. region. All proceeds benefit Friendship Place, a nonprofit organization that addresses homelessness with innovative programs that empower participants to rebuild their lives, find homes, get jobs, and reconnect with friends, family, and the community. This event is a great way to get moving or shake up your fitness routine. Help raise funds to support the mission of the Prevent Cancer Foundation, the only U.S. nonprofit organization solely devoted to cancer prevention and early detection. After the walk/run, explore a health fair and refuel with FREE healthy snacks, flu shots, and cancer screenings. The 5K Run and 1 Mile Walk is the major annual awareness and fundraising event for The Foundation for Women’s Cancer, supporting the full slate of the organization’s research funding efforts to defeat gynecologic cancers. Awards will be given to the top race performers. Registration is available on site the day of the race. Help Fight Hunger Participating in a Turkey Trot Near Washington, D.C.
Cupid's Undie Run 2019 in Washington, D.C.
Where to Celebrate Valentine's Day in Washington, D.C.